The city of Chicago is littered with historians. Depending on where you are in the city, people can remember and share stories of buildings, businesses, train lines, or movie theaters that used to be in certain locations that are no longer there. For example, many people on the South Side can remember how the Green Line used to stretch all the way to Stony Island, but has now been reduced to only going as far as King Drive. No matter where you are in the city if you talk to enough people you will find out what used to be at certain corners or how certain buildings used to look. Our Mayor Rahm Emanuel though is betting that the citizens of Chicago will not remember and will forget everything he has done. Rahm Emanuel is betting that we will forget how he closed the most schools in the history of the United States. He is hoping we forget how neighborhood schools are the backbone of communities. You see since Rahm has been elected (by less than 25% of all the eligible voters in Chicago) he has become infamous. On top of closing the most schools in the history of our country, he has also been mayor as Chicago has become the murder capital of the country, or as my students say ChiRaq (Chicago + Iraq). He gives press conferences where he talks about his “great” new initiatives, but has little follow through. Remember when he promised to get rid of Chicago’s food deserts? Through his time as mayor, Rahm has been taking public money and investing or giving it to private businesses or organizations, like Depaul’s new basketball stadium. He also made sure that bad privatization deals like the parking meter contract stayed in place. Another privatization scheme by our Mayor that has slipped under the radar is the fact he has leased the Port of Chicago to a company based in Denver for 62 years. Just another move by our mayor to make a select few wealthy while allowing money to leave our own city. He almost privatized Midway Airport, but the deal thankfully fell through at the end. Yet when he wants to (which is often) Rahm claims the city has no money for, in his eyes, not important things like public schools, CTA employees, and fire and police people. He has implied these public workers to be greedy. He has slashed school budgets which often resulted in 15% of an entire school’s staff being cut. Schools are reporting there is not enough money for basic school supplies like paper and books. And now reports are coming out that schools do not even have enough money for essential sanitary supplies like toilet paper. But now all of a sudden Rahm is changing his tune. He is announcing the building of a new school on the far South East Side. Never mind that is on a toxic site. Wow, surely Rahm is now finally listening to the people right? Wrong. I couldn’t agree more. Rahm is betting that the voters of Chicago will forget about the countless things he has done to continue to harm working class communities across the city. He is attempting to do a few “good” things just in time for his attempt at a 2015 re-election. After the story in The Guardian about my experiences working in Englewood, I was contacted by the Mike McConnell radio show on WGN radio. After doing some background I was a little hesistant to go on, because Mike McConnell is on the more conservative side and has a history of attempting to bully his interviewees. Other than him trying to get me to talk bad about my student’s parents, calling my kids gang bangers, and implying that because I worked in Englewood I must not be a good teacher, because I couldn’t get a job somewhere else, the interview went pretty well. 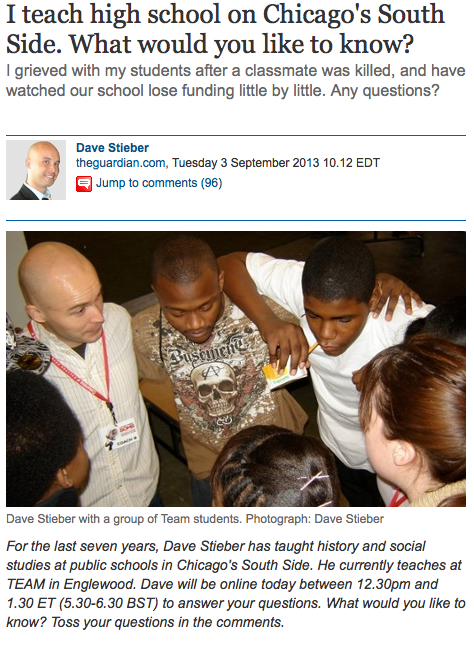 I was featured in The Guardian in the “A Day’s Work” section. I had to answer 6 questions then live respond to questions from the readers. Please make sure to read the comments as that was the most fun part of the whole thing.